What is the legal “date of separation” in California, and why is it important for divorcing couples? The date of separation generally refers to the date the couple’s marriage “ended”, and is used to determine property rights and spousal support. 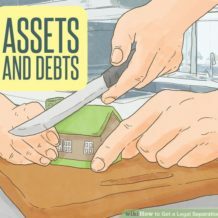 The rents, issues, and profits of the property described in this section. Community property rights terminate on the date of separation. Absent a written agreement stating otherwise, community property owned by both parties only up to the date of separation will be divided 50/50. Separate property goes entirely to the party who owns that property. Since the duration of marriage has a direct impact on long term spousal support, the date of separation is very important in determining the amount of the long term spousal award. Accurately determining the date of separation in a California divorce can have a huge impact on the court’s jurisdiction over long term spousal support. Historically, the courts in California have applied two different tests in deciding the legal date of separation in a marriage: an objective test and a subjective test. Under the objective test, the court looks to the date the couple started physically living apart, with the intent of ending the marriage. Since physical separation alone does not necessarily mean the couple intends to divorce, the court also looks for clear, independently verifiable conduct from the individuals that establishes the marriage is over. Under the subjective test, the court considers evidence from the divorcing couple as to when they considered the marriage to be over. For couples in high-dollar divorce cases, there is an inherent incentive of one party to argue the earliest (or latest) possible date of legal separation. It is likely that the change in the law will benefit divorcing couples who need it the most: those who cannot afford to live “separate and apart” under two roofs, but are still planning on divorcing. Since there is no “bright-line” rule for date of separation, it is important that, if you are planning to divorce, you discuss your separation arrangement as soon as possible with your divorce attorney to determine whether the courts would consider you to be “separated” or not.